When Trae Young set foot on the campus ground of Oklahoma University, he came with big dreams as a baller. Given the chance, he outperformed the expectations of his college basketball coaches. His debut game was memorable, aiming to match the games of Oklahoma basketball legends like Buddy Hield and Blake Griffin. The only disparity between Trae and these guys is that both Buddy and Blake spent multiple years at the university, but Trae spent only one year, forgoing his remaining three seasons of college eligibility to declare for the NBA draft of 2018. The rising star’s freshman season with the Sooners basketball team of Oklahoma University can be said to be one of the most notable freshman seasons in recent times with his stellar abilities in passing and 3-point range. The question on everyone’s lips was who is this freshman that have NBA legends watching his every move? Prior to the beginning of the season, no one knew Trae but once the season took off, his name was on everyone’s lips. Even Stephen Curry, a legendary player of the National Basketball Association and a two-time MVP commended his moves, describing him as unbelievable. Coming from Trae’s own favourite United States Men’s National Team player, that was really some commendation. The famous basketball player was born as Rayford Trae Young on the 19th day of September 1998 in Lubbock, Texas. His educational background can be traced to Norman North High school where he was recognized as a superstar player in the school basketball team as he was named Gatorade player of the year a couple of times and McDonald All-American. His high school basketball statistics earned him the ranking of the #2-point guard and the 15th overall prospect in the United States by ESPN. This is not surprising for someone who started playing basketball at the tender age of three. Trae Young proceeded to Oklahoma University where he spent only one season with the Oklahoma Sooners before he decided to declare for the NBA draft of 2018. The baller recorded notable career statistics during his freshman season with the Oklahoma Sooners of Oklahoma University which happened to be his only season with the college before he made the conscious decision to forgo his remaining three seasons of college eligibility and declare for the NBA draft of 2018. Young was drafted into the National Basketball Association in 2018 as the overall by the Dallas Mavericks, he was soon traded to the Atlanta Hawks in exchange for Luka Dončić. In college, Trae Young tied the NCAA single-game record with a total of 22 assists which was a rare feat shared by the likes of Tony Fairley of Charleston Southern in 1987, Syracuse’s Sherman Douglas in 1989 and another Charleston Southern alumnus Avery Johnson in 1988. He made notable records as the first and single player to lead the NCAA in both assists and points in a single season by the time his only college season ended in 2017. His freshman stats include; a total of 848 points with a record of 24.4 points per game, 271 assists with 8.7 assists per game and assist percentage of 48.6. He also had a record of 261 as turnovers. At the peak of his career highlights is his 2016 FIBA gold medal which he earned as a part of the Under 18 USA National Team, he made the Jordan Brand Class and the McDonald All-American in 2017. On November 12, 2017, his first double-double was earned with the Sooners. See Also: Who Is David Nwaba – The Nigerian American Basketball Player? The young basketballer’s mother is Candice Young, his dad Rayford Young, who bears the same first name as Trae was a notable basketball player during his active years in the sports. He recorded memorable collegiate stats at Texas Tech, making a decent college career for himself. After graduating from Texas Tech, he played professional basketball in Europe. 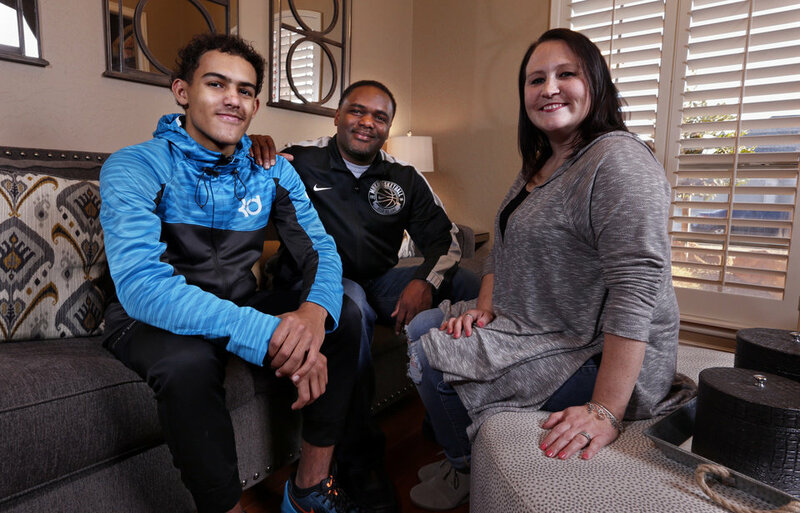 Trae Young is the oldest child of the Young family and his family is said to have relocated to Norman Oklahoma shortly after his birth. He was raised with two sisters Camryn and Caitlin Young and one brother Timothy Young. The basketball star revealed that some of his best moments are when he is out enjoying with Timothy.